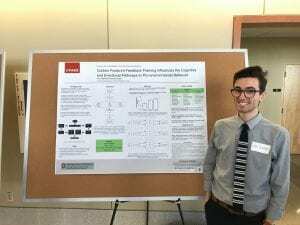 Graduate team member Ian Adams presented his poster on Carbon Footprint Feedback Framing Influences the Cognitive and Emotional Pathways to Pro-Environmental Behavior at the Decision Science Collaborative’s sixth annual research forum on March 26th. Congrats Ian, we are lucky to have you on our team! Posted by hendey.4 at 2:01am April 2, 2019 Posted in Uncategorized. Bookmark the permalink.